I super love this new show on the Animal Planet - Last American Cowboy. It premiered last night, Tim and I watched it and it is so good. It gives you a glimpse of what it is like working and living on a cattle ranch. The American west is the star of the show, the animals and the families working the land give it even more color. I love horses, cowboys and the west so it was right up my alley. I would love to work on a ranch for a week just for the experience and to ride on the back of a running horse through the great wide open would be a dream come true! Hidden amid the mammoth- Montana landscape are three family-owned and operated cattle ranches and the setting of Animal Planet's newest original series, LAST AMERICAN COWBOY. This epic adventure follows three families of tough, tenacious and headstrong cowboys through freak storms, deadly outbreaks of disease, hungry predators and forest fires that threaten their livelihood. Each ranch will need to rely on family bonds and personal strength to keep this tradition of the American West alive. Premiering Monday, June 7, at 10 PM (E/P), LAST AMERICAN COWBOY shares the highs and lows of life on a ranch for the Hughes, Galt and Stucky families. From the multi-generational ranch family committed to working only on horseback to the modern rancher who uses high-tech equipment, all-terrain vehicles and even a helicopter to manage his massive operation to the small nuclear family determined to persevere against all odds, all must struggle to make ends meet and all are deeply committed to this classic way of life lived close to the land. The Hughes family, the smallest of the three ranches, is as close to "Little House on the Prairie" as you can get. Scott and Stacey Hughes, along with their three-year old son and nine-year-old daughter, live on a 12,000-acre ranch and manage their herd of 500 Black Angus all alone. 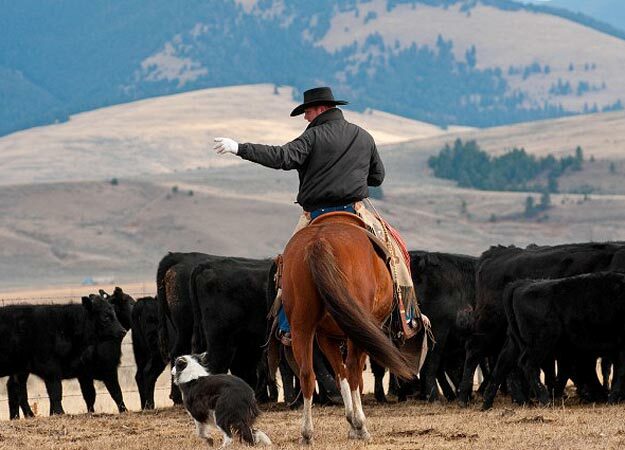 Comparatively, the Galt Ranch is one of the largest cattle ranches in Montana with over 100,000 acres, 5,500 cattle and 100 horses. It is so vast that owner Bill Galt manages it from the sky in his own helicopter. Bill and the rest of the Galt family believe technology is the future of ranching and necessary to efficiently run a ranch of this size and caliber. Contrary to the Galt family, the Stuckys are traditional ranchers choosing horseback over ATVs and doing most of the work by hand. Keeping these traditions alive is deeply important to the entire clan, and as the ranch continues to grow and expand, the Stuckys hope it will be passed down through generations.LAST AMERICAN COWBOY thrusts viewers into the glorious landscape of Montana and the remarkable world of cattle ranching. For these families it comes down to one paycheck per year, and they will do whatever it takes to continue to live and to share the life they love. I love this show! I have lived and worked on my family's ranch since I was old enough to walk, so I know first-hand the trials of every day ranch work. Unlike movies and documentaries that paint an unrealistic picture of what the life of a rancher is truly like, Last American Cowboy is probably as close you can get to the reality of ranch life on a television screen. They don’t sugarcoat the story. It also does an extraordinary job of showing the contrast of small, traditional ranches that refuse to change or modernize their equipment, versus the larger ranches that welcome new methods and technology. In my opinion it is a must-see.